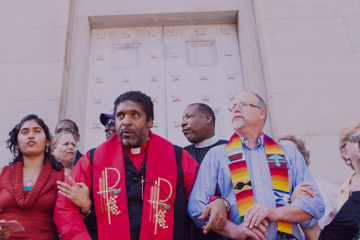 EDITOR’S NOTE: The Rev. Dr. Katharine Henderson is president of Auburn Seminary, a multifaith leadership development and research center. She is the author of “God’s Troublemakers: How Women of Faith are Changing the World” and is ordained in the Presbyterian Church (U.S.A.) We’re glad to partner with FaithSource to share this piece from Dr. Henderson today. As a Christian, I am certain that battening the hatches, erecting stronger barriers and higher walls, gating our communities, and staying home is not the revolutionary love that Jesus talked about. But in the wake of the litany of violence plaguing our world, our most logical reaction might be to do just that — avoid concerts, sporting events, the local mall, even Bible study — as none seem safe these days. But I think the opposite should happen as many of us have basked in retreat far too long, holding back out of fear and self-protection. So I boarded a plane for Cleveland last week, bound for the Republican National Convention. For those who know me, the RNC is not my natural habitat. I was compelled to go for two reasons. First, I have become uncomfortable with the distance and fear that grows ever larger between me and the things I do not know. It was becoming too easy for me to see “those” Republicans as “the Other” during this polarizing time in our country. I needed to feel the atmosphere on the streets where Republicans were gathering, and have conversations with strangers who, perhaps too often, are those from whom I am estranged and maybe, if I’m really honest, the adversary in my mind. On this winding bus tour through the hot mid-Atlantic to New England, the bus was stopping at the RNC in Cleveland then zigzagging its way to the DNC in Philadelphia, with a mobile lemonade stand in tow. 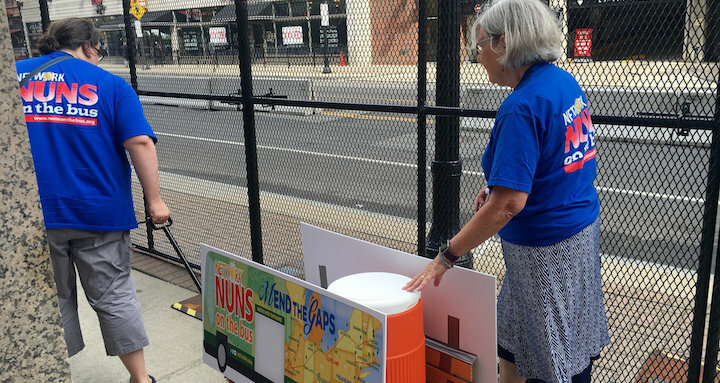 Which is how I found myself walking the streets of Cleveland with nuns offering strangers a simple act of kindness — a cup of lemonade on a very hot day – as they made their way to the convention center. As folks engaged in conversation with us, I felt an eagerness, on both sides. Yet I was also taken aback and saddened by something I heard time and again. The sisters asked people to describe their personal hopes for the nation and the world they dream of for their families. But answers came in the form of political platforms and less like hopes and dreams: smaller government, more freedom, a return to greatness. It felt as though folks were channeling talking points, parroting words that had long lost meaning. It felt as though many Americans were so fearful that they had lost sight of their dreams or even the capacity to dream. Of course there are people on both sides of the aisle who live in daily fear, not sure if they can carve out a living wage, feed their children, or keep a roof over their head. My African-American friends live in fear of police, and neighborhoods that are unsafe for their children to simply cross the street. And I can’t imagine what it would be like to be the wife or husband of a police officer. We felt no physical danger on the streets of Cleveland, despite pre-convention fears of possible violence. Still a fear and pessimism permeated our street conversations and made me see how fearful people are of our country’s changing demographics. 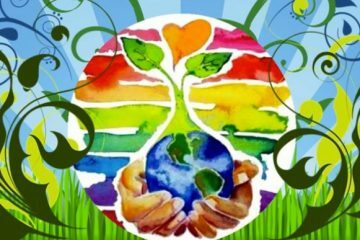 We will be a white Protestant Christian majority nation no longer and that is causing many to feel adrift and isolated, erecting walls, angry to the boiling point and scaring the hell out of each other. Letting someone else define our hopes and dreams might be tempting at such times, but life with God was never meant to be a passive spectator sport. Nor is our U.S. Constitution. This country was not founded on the static principle of We the White Majority. It was founded on the evolving principle of We the People, where today all are protected by the wisdom of this living, revolutionary document. During these two weeks of wall-to-wall RNC and DNC, my Christian faith quietly reminded me of the courage we can sometimes misplace: God has not given us a spirit of fear, but of power and love and self control. (2 Timothy) We must not let fear define our hopes and our dreams because their content says everything about who we are, what we care about, and most important, what we can be.